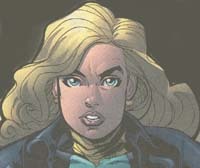 The daughter of the first Black Canary, Diana grew up hearing of her mother's exploits, and she too wanted to be a hero. Against her mother's wishes, during her teens, Diana trained at night with help from her "uncle" Ted Grant (Wildcat I). Eventually she donned her mother's former persona of the Black Canary. Her very first adversary led her to a fateful meeting with four other rookie crime fighters and together they founded the Justice League of America.